Many people in the SMEM (Social Media in Emergency Management) community are expressing interest in starting a VOST, or Virtual Operation Support Team. While it’s possible to set up a social media operation from scratch with new volunteers during a disaster, it can be very difficult and distracting. It’s not possible to plan for every eventuality, but having some core volunteers in place, having a plan, and being proficient with some basic social media tools will make activating your team for a social media disaster effort much easier. Community Members: Set Up Now – Hopefully with support from your local Eemergency Management Agency, but if necessary, set it up yourself. In an ideal world, you would be setting up your social media in disaster/VOST effort with official sanction from your local emergency management agency. Realistically, however, not all EMs are ready or able to accept your VOST in an official way at this point. Yet social media efforts are happening more and more, almost every time there’s a disaster, so if you have your team and tools in place, you can be ready to operate, inviting all stakeholders to take part, including emergency management. In several recent cases, social media efforts that were started or operated by volunteers were ultimately accepted, used, and praised by local EMs. If you’re not involved with Emergency Management in your community, make every attempt to include and encourage your local EM agencies to participate in your social media efforts. It is ALWAYS preferable to work with emergency management form the start – but realistically, many EMs are not ready or able to take this step yet. Be positive, and if your EM says no, stay positive. You will want to ask again in the future when they’re ready to reconsider. Send your local emergency managers, CERT teams, ARES ECs and first responders invitations and info every time you participate in social media; give them gentle but persistent reminders that your group is organizing to assist in disasters. Try to get your foot in the door. Participating in existing disaster-related groups such as CERT and ARES is a great way to gain trust and demonstrate competence. If you don’t have the time to put together an entire VOST team yourself, that’s okay! Do what you can for now; participate on an existing #VOST team in your spare time, build your skills, be ready to help others on their VOST efforts if needed. • What other organizations are doing interesting social media projects in your community? Building a new VOST does not happen overnight. Here are some suggestions to assist you in creating a VOST for your community or organization, with or without official buy-in from your local emergency management agency. Step 1: Learn how a VOST works by volunteering with one of the existing groups or teams. ** This experience will help you to see what a VOST can and can’t do, and the networking will help you as you set up your own VOST and for future activations where more than your own team is needed. Begin outreach early to your local emergency management, preparedness, first responders and disaster recovery groups. Step 2: Get active in social media and in your local community. Learn which social media platforms are used in your community. (You will want to have both local and nonlocal VOST members.) Put out the word that you’re working on this and post updates as you progress. • 2a- Locally, organize by presenting on the advantages of being prepared to use social media in disasters to those in your community that are interested in all phases of disaster: CERT, ARES, Red Cross, ham clubs, Fire & Rescue, VOADs or COADs, youth groups, community service clubs and faith-based groups. • 2b- Non-locally, participate on a VOST that is located outside of your area. Take part in the operation, chat with others in the backchannel chat, learn how VOST works and ask if anyone might want to also help you set up your own VOST. Consider signing an MOU with another VOST group outside of your local area so that you can each support each other remotely in a large scale or catastrophic disaster. Step 3: As your team forms up, get some VOST practice by live-tweeting a live event such as a conference, a sporting event (our VOST had a great time trying this for Super Bowl this year!) or a festival. Ask CERT and ARES groups if you can practice operating on social media before during and after their next preparedness event! Step 4: As your VOST continues to build its skills, offer to assist others on real disaster activations. Be sure and have members practice a variety of tools and platforms so that they aren’t too specialized. Document your efforts so that you can present the results of your efforts to local emergency management agencies, disaster – related groups, and the VOST Initiative Community. Step 5: Link up with other VOST groups so that we can all support each other in disasters. Participate in #SMEMchat and the #VOSTchat, share what you’re doing on your VOST blog or facebook page. Help to build the community so that there are more people trained to assist in this effort. Step 6: Keep building the local community connections that will help you to make your social media effort work well with other local efforts, including emergency management and all disaster-related organizations. Be ready to offer your VOST when needed. We are a volunteer technical community that has to demonstrate our ability to help, just as ham radio operators did – now they are in every EOC during disasters. We can be too some day. Well done! You have a VOST now. By the time you work your way through these steps, you should have a good VOST group that can help your community as well as others. 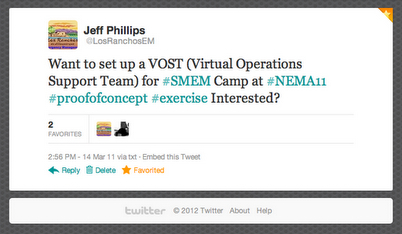 * Special thanks to Jeff Phillips, @LosRanchosEM, who one year ago today put out the call on twitter for the first VOST volunteers. I’m proud to be a member of the Osbourne VOST! ** For more info on VOST team formation, watch the #SMEM and #VOST hashtags on twitter, and visit the VOSG.us website for more info and to share your efforts with the rest of us! Special thanks to Cheryl Bledsoe @CherylBle and Jeff Phillips @_JSPhillips for their input and encouragement on this post and for their hard work and dedication to the #SMEM and #VOST Initiatives. The many other talented VOST Members also deserve recognition, and they’re all listed in my previous post on this site called “VOST: Virtual Operations Support”. I share this amazing piece of information given to the world by @sct_r Scott Reuter. This short guide to setting up a #VOST is great start to setting up VOST in your community.